Another type of number which is difficult to understand and has a complicated relationship to reality is the imaginary number denoted by i which is equal to square root of -1. Now, any negative or positive number multiplied by itself yields a positive and not a negative number, so the square root of -1 cannot exist in the field of real numbers. (square root of -3 can be written as 3i and so on..) But this kind of number has been defined in order to solve certain algebraic equations where roots of negative numbers appear. (They do so because the field of real numbers is not algebraically closed i.e. the solutions lie in a different field to the coefficients) A complex number consists of a real and imaginary part and can be written in the form of a+bi, where a and b are real numbers and i is the standard imaginary unit. So now a real number can be thought of as a special case of complex number where b=0. A complex number can be plotted on a graph with the real part on the x-axis and imaginary part on the y-axis. Using complex numbers means that we need never get stuck at solving tricky equations (the field of complex numbers is algebraically closed). They are very useful in many fields but in the field of Quantum physics, they are not just useful they are essential. With real numbers we can describe the geometry of solid, geometric shapes like squares, cylinders, spirals etc. 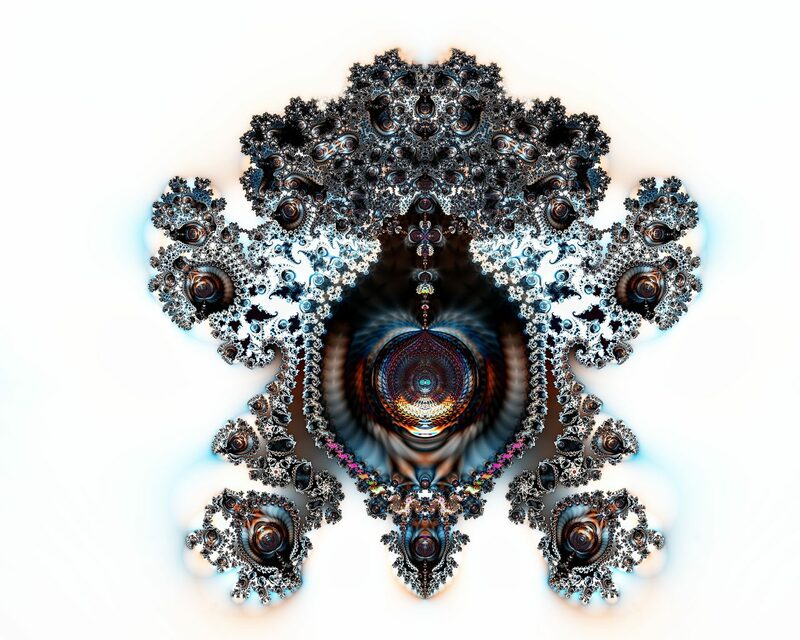 Benoit Mandelbrot discovered (accidently) that complex numbers could be used to describe complex shapes. Consider the equation zn+1 = zn2 + c ; where z and c are imaginary numbers and n increases by 1 each time. This means that the output squared and added to c is fed back to the input for calculation of another output. 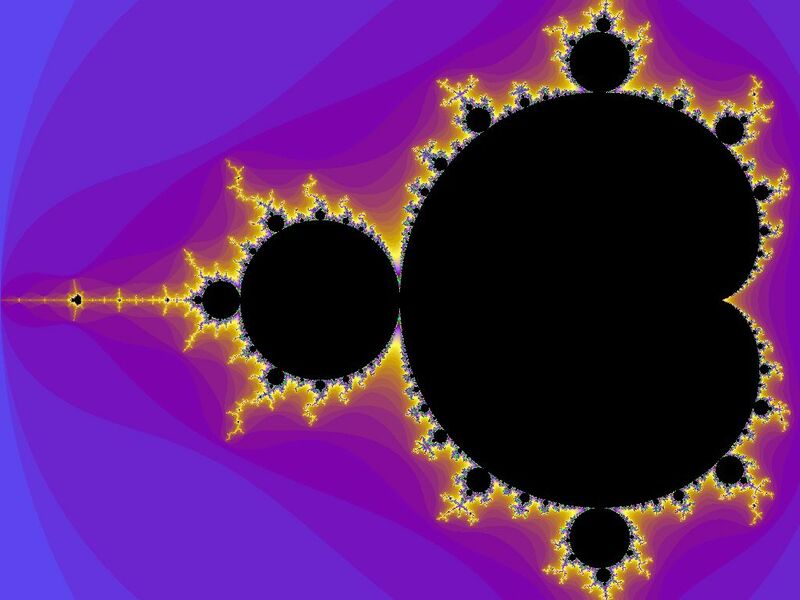 Mandelbrot wanted to know for which values of c, the magnitude of zn would stop growing when the equation was applied for an infinite number of times. He discovered that if the magnitude went above 2, then it would grow forever but for the right values of c, sometimes the result would simply oscillate between different magnitudes less than 2. 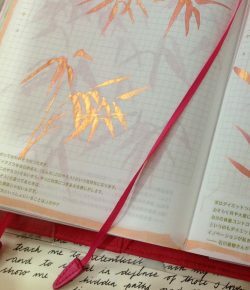 He plotted these values with the help of a computer and was amazed to see a complex pattern which when magnified revealed a similar hidden pattern and this pattern went on infinitely. He named this pattern a fractal. 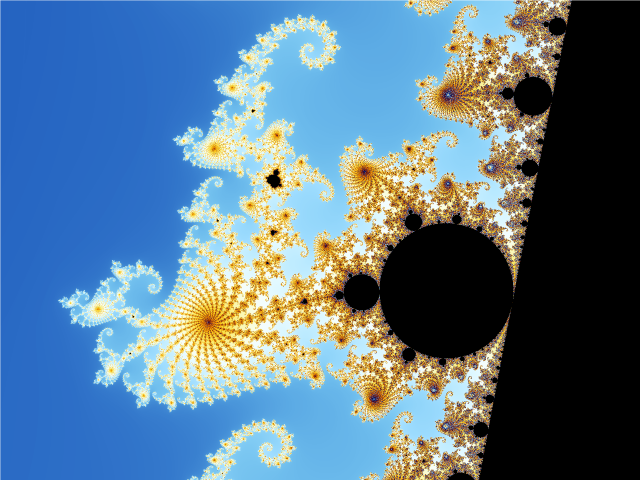 A fractal has the self-similarity property of having the same (irregular) shape at all levels of magnification. Mandelbrot soon realised that fractal shapes appear everywhere in nature. A mountain range for e.g or a coastline, lightning or systems of blood vessels. These shapes cannot be predicted exactly in their details but the general shape can be approximated. Since then a variety of fractals have been discovered and some of them lie at the heart of a new branch of mathematics called chaos theory. Fractals are also used as the basis for digital art and animation created with the help of a fractal-generating software. Another interesting number (this time,real!) is a constant denoted by c which is the speed of light in vacuum (approximately 186,282 miles per second which is essentially the speed limit of the universe). That the speed of light is constant regardless of the frame of reference of the observer is a very strange phenomenon that we are not normally aware of because it is so incredibly fast. If you are travelling on the highway in a car, for e.g, at 60 mph, your speed relative to the stationary objects like the trees that you pass by is 60 mph, but your speed relative to a football in the next car seat is 0 mph, likewise your speed relative to your friend driving by your side at the same 60 mph is 0 mph. If he is travelling at 60 mph in the opposite direction, then you will see him as driving away from you at 120 mph. If you shot a bullet from your car(! ), then the total speed or velocity of the bullet would be the speed at which you are travelling + the speed of the bullet. Then, you would naturally expect that if you switched on the headlights of the car, the total speed of the light would be the speed of the car + the speed of the light but this is not so. This is actually very wierd and easier to visualise (that it is wierd!) if you imagine yourself travelling in a rocket at a speed close to that of light. You would always see light travel at c regardless of the speed you yourself are travelling at and is the same even if you were travelling in the opposite direction! How can this be? Special theory of relativity also predicts length contraction (decrease in length of objects travelling). The general theory of relativity predicts (among other things) gravitational time dilation – gravity influences the passage of time. The more massive an object is, the slower time runs; the further away you are from the object the faster time runs. This notion of space, time and velocity being interdependent (where before Einstein, time was thought to be constant) has forced us to think of the universe as a space-time continuum in four dimensions, 3 spatial and one of time.